What goes around has come around. A decade after Temple was kicked out of the Big East - for cause, by the way - the Big East football conference is teetering, its survival in question, while the Owls are airborne, putting a real product on the field. There is some irony - and it could yet turn into bitter irony on North Broad Street - that Temple is proving worthy of playing Big East football, even helping Big East football, at the exact moment you have to wonder if Big East football will continue to exist. A victory by any score Saturday at Maryland would have made a compelling case. Temple obviously did much more than that, running up a 38-0 lead, finally gifting the Terps a late score for the 38-7 final. This was the first Temple victory over an Atlantic Coast Conference school. 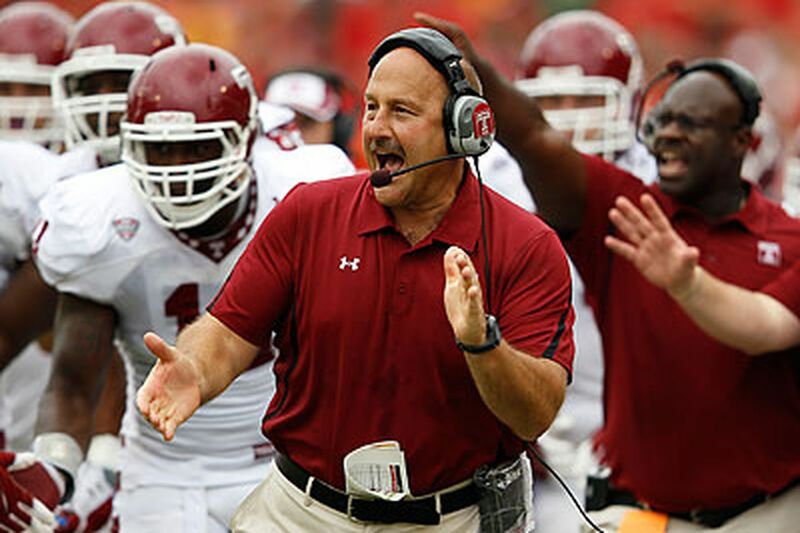 And it was more than that: The first time Temple ever whipsawed a BCS-conference team. The Owls, now 3-1 going into their Mid-American Conference schedule, probably are a play or two they'd like back against Penn State from being ranked right now, from being the shaggy-dog story of the season. Almosts don't matter, of course. They are what their record says they are. But Bernard Pierce's five touchdowns against the Terps will put him on the Heisman mention lists. Just as important, Temple's defense is a force. Maryland couldn't run against Temple (45 yards) and averaged just 5.3 yards per pass despite having one of the better QBs in the ACC. Temple may be the only school that is sure it wants to play Big East football. If you look at the teams left in the league after Pittsburgh and Syracuse announced their defection to the ACC, all but South Florida and Cincinnati have been seriously linked with other conferences since Pitt and Syracuse got out. Even potential additions such as Navy are saying hold on. The Midshipmen can recognize murky waters when they see them. Within the Big East, there are questions just under the surface about whether the league should continue to worry about football, if the cow hasn't already left the barn. If a Louisville or a Connecticut takes off next - and certainly if both leave and Rutgers, TCU and West Virginia find places to go - it will be next to difficult to make the case that Big East football schools will be the right partners for Villanova, for instance - that the Wildcats wouldn't be better off with Georgetown and Marquette. Things are very tricky right now on the Main Line. It's more clear-cut on North Broad. I wrote last week the reasons the Big East kicked the Owls out in 2001 no longer exist. Back then, Temple simply brought nothing to the table. We're not suggesting the Owls suddenly will fill the Linc or deliver monster television ratings. The Owls aren't suddenly in this great position of strength. This is more about lack of weakness. And this still is the No. 4 TV market in the country. Lack of weakness should be enough to be attractive right now for a league that is seriously talking about bringing on a service academy in Colorado. If there really are current members committed to playing Big East football, they should call the Owls pronto. The only school ever kicked out of Big East football should be the first school brought back. It would enhance the league. Call that one of the strangest twists of this whole realignment saga.